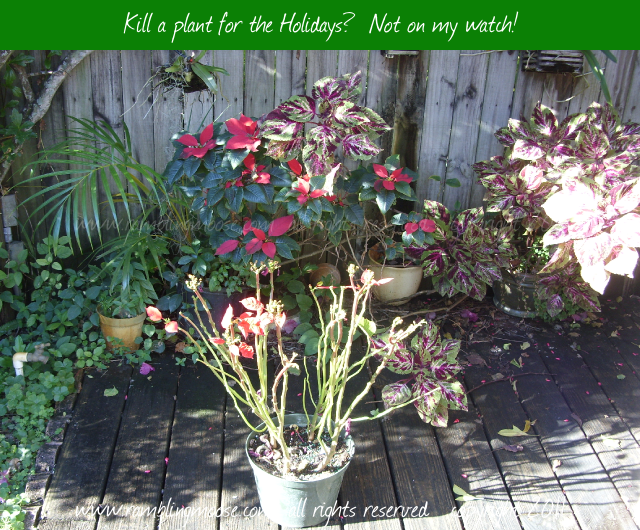 Rambling Moose: Kill A Plant For The Holidays? Call this Before And After. The Before would be the sad looking pile of sticks in front. That's a Poinsettia plant that someone left literally on the side of the road. Courtesy of them and my 6 AM dog walk, it now rests in the foreground of this shot. The After would be the plant behind it in the shade. That's Last Year's Poinsettia. Someone left that one in a dumpster. It was in the same shape as the sad pile of sticks in the foreground in the little pot. Both of them will rest under my Orchids getting watered daily on the run off from the drip feed irrigation lines that we have installed. It won't take a year but the one you see here will end up as healthy as the one from last year. Honestly folks, it isn't that hard to do. When you get a plant check it at least twice a week to see if it needs water. In an office, more frequently may even be worth it. The pretty red, pink or white leaves will stay on the plant longer and having it there will show the person who gave it to you that you really did care for the gesture you made. Just don't leave it outside on a day that the temperature drops near freezing. They don't like that. I have a habit of collecting plants. I have ever since I was a wee loudmouthed brat. Now, I have a whole back yard to fill. In reality not a whole back yard. The collection is getting unwieldy, but it is pretty in its own right. All but the citrus trees. They're starting to look sad. There's something back there eating them. I'm thinking I may have to start spraying those again. It's a challenge. A welcome one but a challenge. CLUE #2: Plant it in an area where it will get NO night light. Away from street lights and outdoor lights so it will recieve the right amount of dark nights to allow it to bloom.